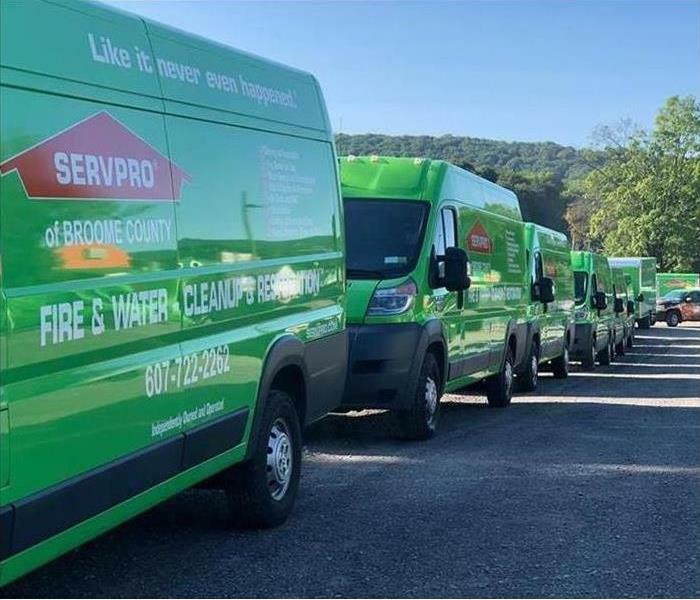 SERVPRO of Broome County West has a large fleet that is kept in top condition to assist you in your time of need. We travel near and far to any size loss and are always on call to serve you. You're in great hands with our team of capable, knowledgeable and friendly production crews. They are always happy to help! 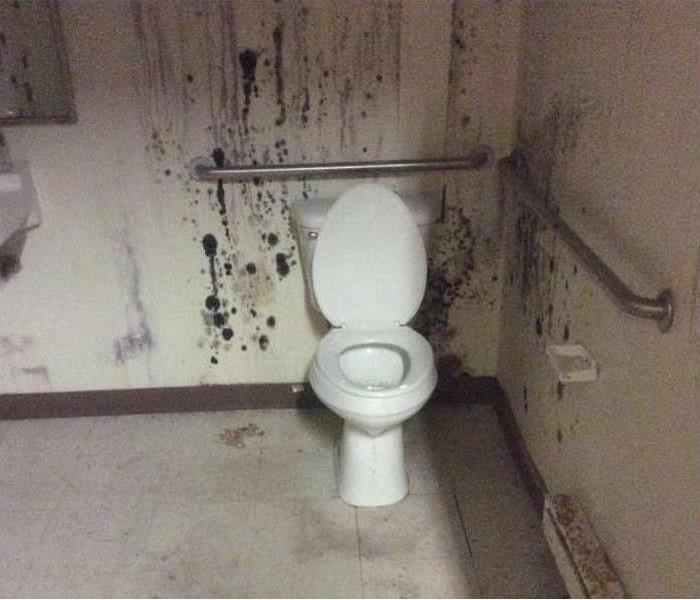 Following a local rain storm event this local business had extreme back up of sewage and drains in their restrooms. This affected majority of the basement sales area. They quickly reacted and called in SERVPRO to remediate the loss. Our team worked diligently to get them back to normal as soon as possible. 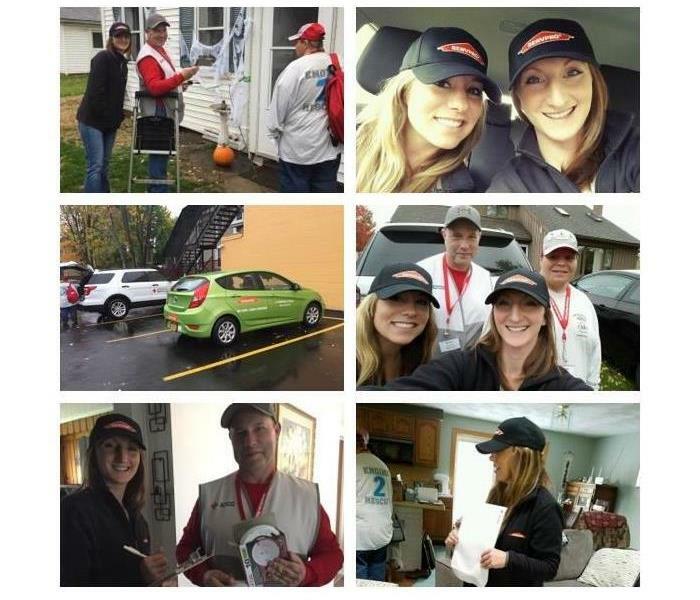 SERVPRO has storm response teams stategically placed throughout the country in order to help home and business owners when we're needed most. 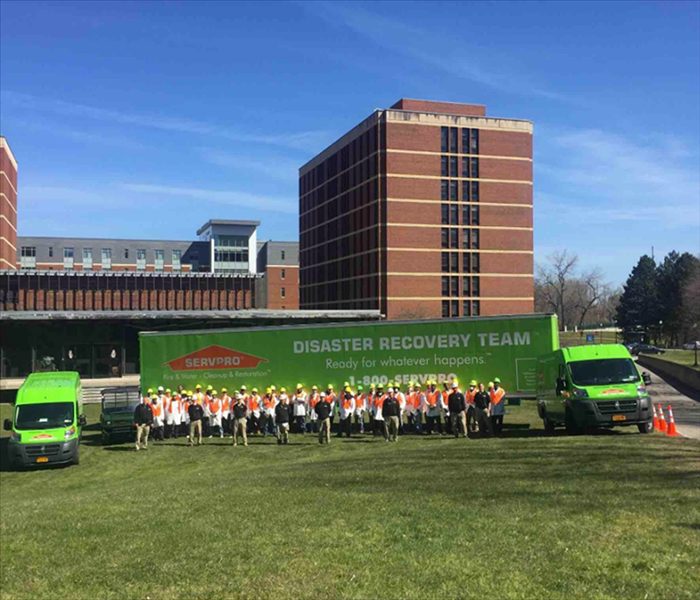 Following the flooding caused by Hurricane Matthew in 2016, SERVPRO response teams deployed to assist in the cleanup and restoration of the affected areas in the South. SERVPRO of Broome County West Commercial Large Loss Division was one of those Teams! Following Category 5 Hurricane Irma, our Large Loss Team responded to storm damage needs in Florida. This particular resort experienced roof and water damage as a result of hurricane force driven winds and rain. Our Team removed saturated walls and placed equipment. With no power initially, high humidity, and extreme moisture within the property, it was important to have a quick response in order to prevent further damage. Placement of Air movers is crucial while drying out a structure. 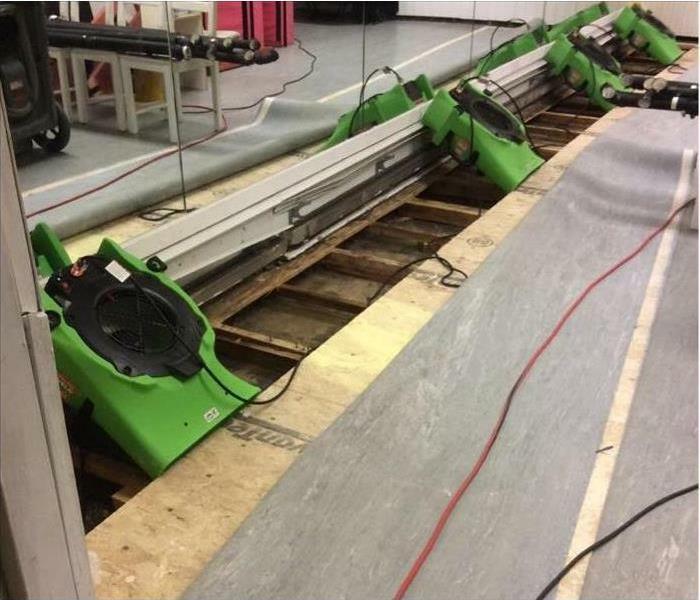 This local dance studio was flooded and we had to get creative to save their flooring. We were able to angle the air movers perfectly to create air flow underneath the floor to begin the process. 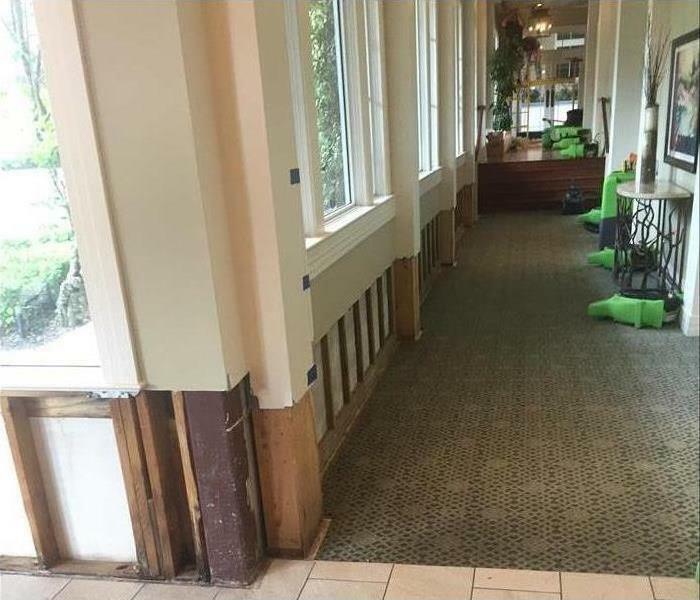 Sometimes water damage can be unseen until secondary damage sets in. In this multi unit property, an upstairs shower had been leaking and caused the ceiling below to get affected. 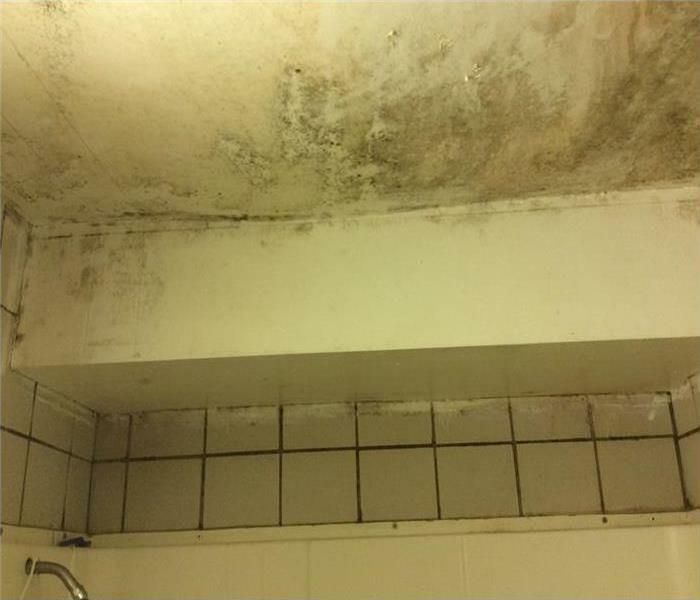 It wasn’t until spots of mold were seen that the leaking shower drain was discovered. They called in our team and we were able to assist with mold remediation services. 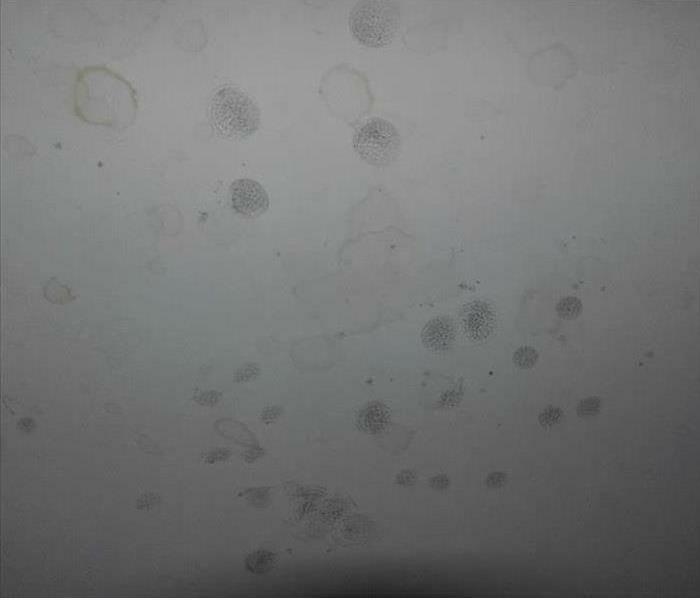 This is a photo of Mold found inside a hotel that just experienced a hurricane in Florida. Our Commercial Large Loss Division was able to travel to assist those in need after such a devastating blow to this particular community. 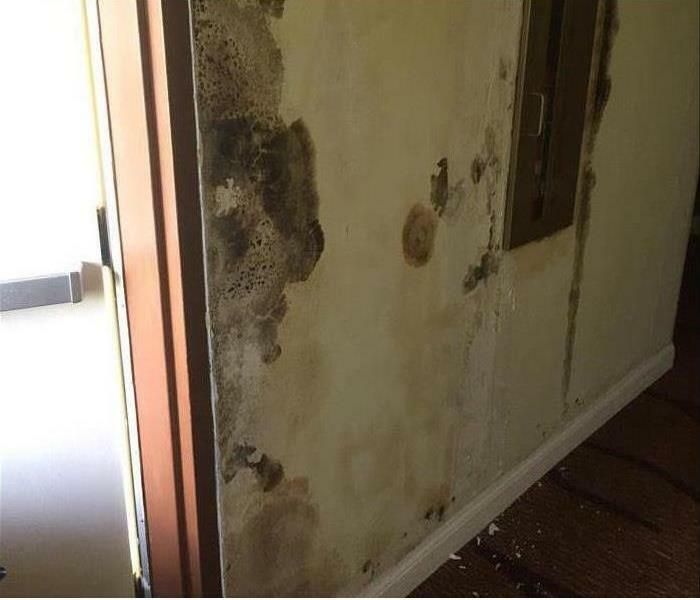 Our team is licensed in Mold Remediation in the State of Florida and was able to help them through the situation. 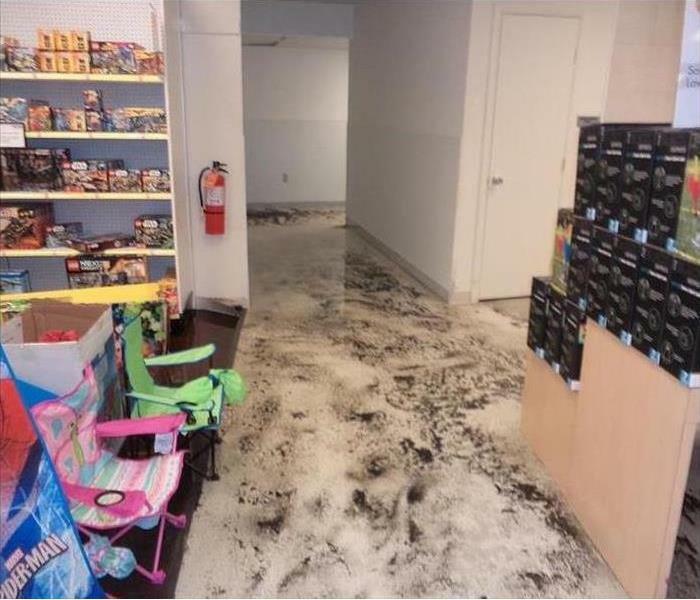 This was the source of a Mold Damage at a retail store. Our team was able to assist this client with mold remediation and get their bathroom back up and running for their customers. Due to ventilation issues in a dormitory there was unnecessary moisture in several of the dorms. This caused mold to form over the surfaces in all bathrooms in the dorm. SERVPRO was contacted to remediate and correct the issue after the vents were properly fixed. Our TEAM performing Fire mitigation services at a Manufacturing plant. It was our number one priority to make the area clean and safe again to work, and minimize the amount of business interruption that was to occur. Throughout the mitigation and repair process our client was very pleased with our daily job progress updates and ability to work with all parties involved to make the business whole again. 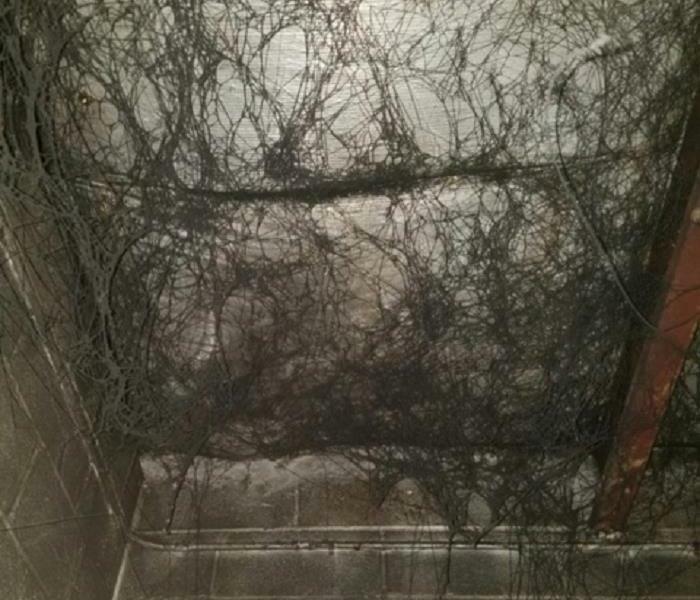 Did you know that Soot webs or "dirty cobwebs" are actually ionized fire soot particles that create chains after a fire? After a residential or commercial fire, you'll probably see these built up in certain areas. This is a photo of a recent flood damage locally. 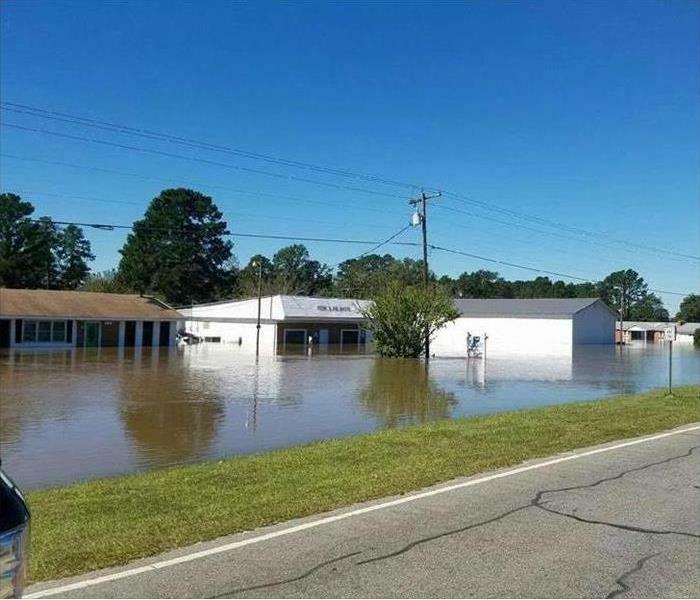 The creeks and streams around the area flooded many local businesses and homes. 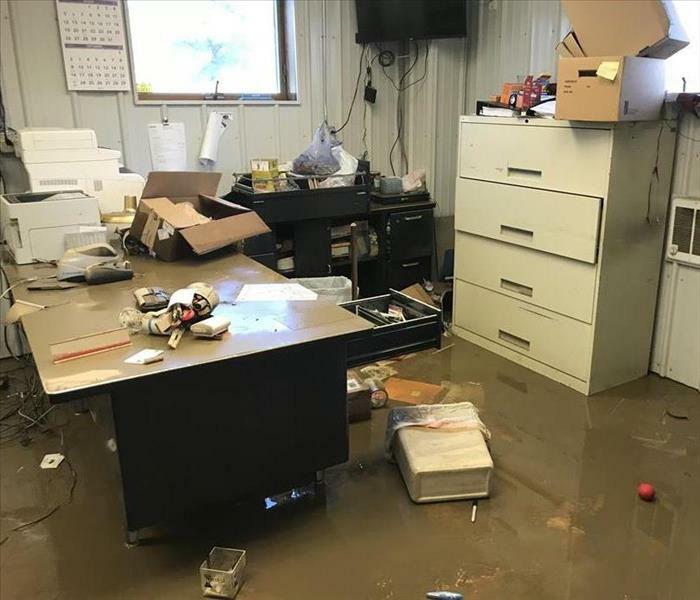 We were able to assist this town office with their cleanup and get them back to work quickly. 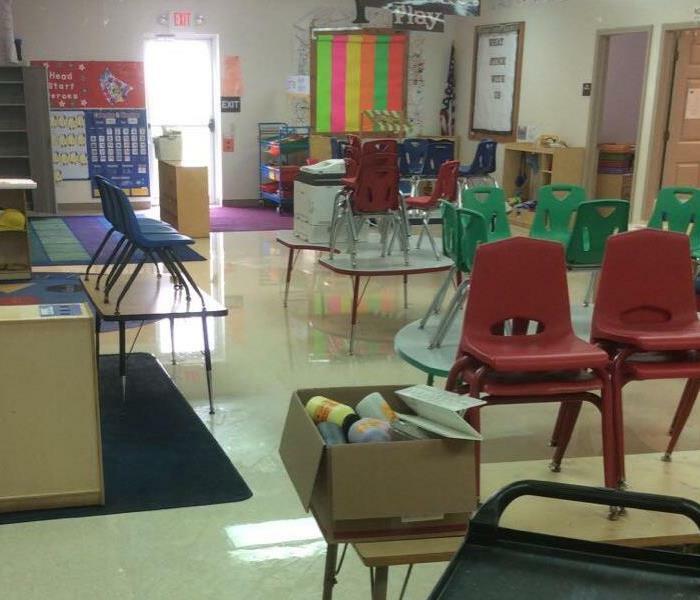 We were called in to assist a local head start classroom after they suffered a water damage. This is what we walked into when we arrived to start the mitigation process. The teachers and parents were thrilled when we were able to get them back up and running quickly to continue their educational programs. This local sporting goods distribution center was about to open in 2 weeks and had a major water damage throughout the entire property. The locally owned business knew to call us in to make sure they were up and running quickly to finish their last minute tasks before opening. We received a call to assist in the decontamination of an entire University Campus. It was important to the school to have a clean campus in order prevent further student outbreak. SERVPRO had the products and the manpower to necessary assist our client in a timely and professional manner. We helped a client whose rental facility suffered fire, smoke and soot damage in the peak season of their business.This warehouse housed thousands of rental items. We were able to quickly respond and clean the warehouse and rental items with minimal business interruption. At the end of the day the client was ecstatic with the result, professionalism, and daily communication and updates from our team. 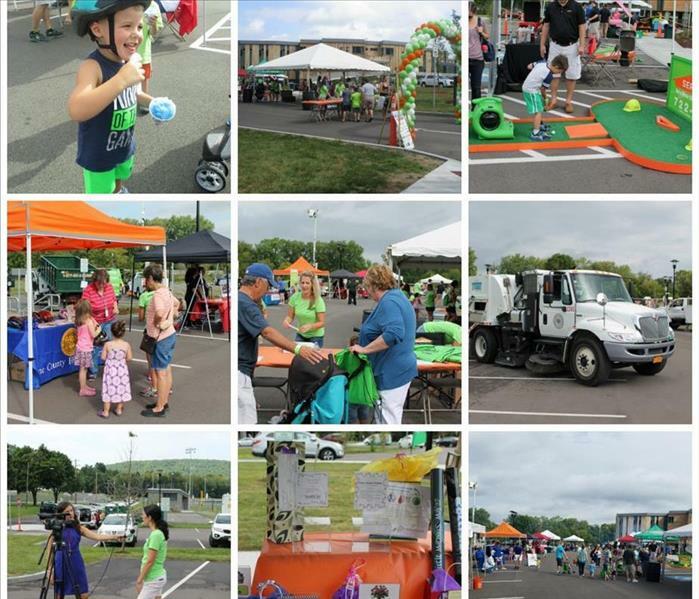 SERVPRO of Broome, Tompkins & Tioga Counties hosted a Health and Safety Jamboree, featuring a Touch a Truck Expo, 10+ Health & Safety Vendors, raffles, giveaways, car seat checks and more. All proceeds went to benefit the Mothers and Babies Perinatal network. A great time was had by all! We had a couple of our staff out assisting the American Red Cross's Home Fire Preparedness Campaign. Our team assisted ARC volunteers with educating residents on home fire safety, preparedness, and free smoke alarm installation. Our Large Loss TEAM works to make sure every aspect is clean! 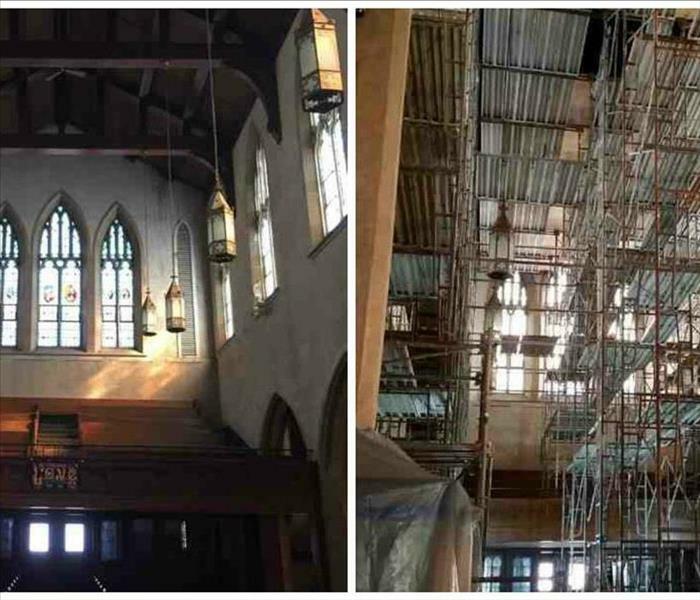 Following a fire in a large church, smoke and soot affected every wall and ceiling. 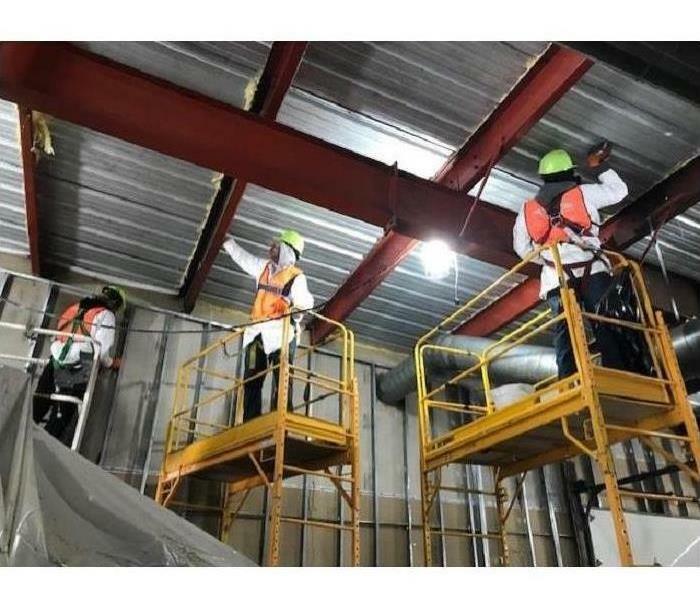 Our team used 52' high scaffolding to reach every ceiling surface. No Matter the size of the job, we will work with our customer every step of the way!